If you're looking to make some extra income, you may be curious about becoming a notary public. 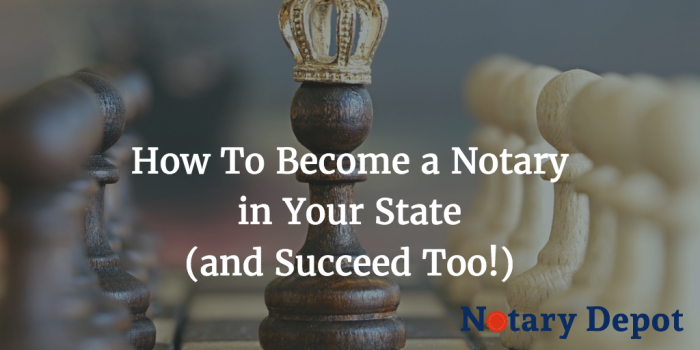 The steps are surprisingly straightforward, but every state has differing requirements regarding how to become a notary public. Luckily, we've got the ultimate guide to make sure you become a notary public the right way. We've also got some tips to ensure your success at your new business venture! A notary public is an official witness. A notary is sometimes necessary when it comes to signing legal documents. They can verify that your signature is legitimate. They can also administer certain oaths in regards to legal documentation. In short, a notary can help verify that legal documents are, in fact, legal. While the steps on how to become a notary public may seem straightforward, you have to remain impartial. Even if it isn't your full-time job, it's still an important legal designation. You will not be able to use personal discretion when it comes to being a notary. If you're interested in how to become a notary public, we've got the most important steps for you to follow - along with some tips on how to succeed! Be a resident of the state for which you're applying. However, if you're a lawful alien of your state or you have an official business located there, you can still qualify. Retain good reputation and morals. While this can vary from one personal opinion to another, you want to make sure that your character is outstanding prior to applying to be a notary public. If your city or town doesn't have a great impression of you, you may want to figure out how to clean up your reputation before taking the steps to apply. Have a clean record. Check your state's requirements in regards to this step. While some states are more lenient, you cannot be a notary public if you've ever been convicted of a felony. Some states vary on whether or not convictions of lesser crimes are permissible. Be able to read, write, speak, and comprehend English. This doesn't necessarily mean you have to be natively fluent in English, but you will need to have a certain level of fluency to deal with legal documents. Have familiarity with the notary laws in your state. Each state has different requirements regarding how to become a notary. Be sure to research the appropriate laws for your state and ensure that you meet all the requirements. After you complete every step of the application, depending on your state requirements, you may be commissioned to become a notary public. This will involve taking an oath of office. After that, you'll be able to do everything a notary public does! You'll effectively be in business. Screen those who sign sensitive documents. When it comes to documents such as property deeds, you'll want to make a judgment on whether or not the person is "worthy" or "valid" of signing it. Verify that intimidation tactics are not used in acquiring signatures. Remember, you won't be able to exercise any personal discretion when it comes to your new position as a notary. You can't turn someone away due to race, gender, religion, sexual orientation, nationality, or politics. To do this, you'll want to check out other notary fees in your area. Make sure your personal fee is competitive while still allowing you to make money. Be aware that some states have a maximum fee that you can charge. You'll want to be careful that you don't exceed that. This should probably go without saying, but there are certain things you can do to ensure that your client has a positive notary experience with you. Let them know up front what your fee is. Make sure you arrive at your appointments on time, well-dressed and ready to act professionally. For any new business venture to succeed in today's market, niche markets are very important. Tap into a resource for notaries. Focus on attorney documents or real estate. This doesn't mean that you can't notarize other documents, but you want to concentrate on certain markets. Most states don't require you to submit to a background check. However, it's not a bad idea. Notaries are required to be upstanding individuals, and you want as much proof of that as you can possibly get. Many title companies require background checks in order to be approved to notarize their documents. While some states automatically bond you prior to commissioning, some don't require it. It's recommended anyway as it protects the client if you make a mistake in notarizing their documents. Make sure you have Errors and Omissions insurance on the off-chance you make a mistake while notarizing. This may help cover you for any financial damages created. It may also protect you in the event of a lawsuit. Finding out how to become a notary public is the easiest step to the process. Applying and being commissioned are only the tip of the iceberg. Once you're official, you have to maintain professionalism. Remember, even though it may not seem like much, it is a legal profession. You need to hold yourself up to the highest standard. Remember to remain professional, well-mannered, and savvy, and you won't have any problems at all. If you have any questions regarding how to become a notary or steps to take afterward, feel free to contact us!